My name, Selena, is Greek and in Greek mythology Selene is the Goddess of the Moon. (I have always though that this was very cool!) My name actually inspired me to travel to Greece and Turkey in the Summer of 1990 to see the Greek ruins and cruise the Greek Isles. In honor of my namesake, Selene, here is her bio courtesy of Mythography and some pictures that I took at the beginning of September of the Moon and Clouds in the skies above our humble abode (check on the Christmas lights still on the house in one of the pics.) Don't ask me how I was able to get such cool pics of the moon -- I used an Olympus digital camera and used the M setting on the dial. Enjoy! Selene was the Greek goddess of the moon. According to the poet Hesiod, Selene was the daughter of the Titans Theia and Hyperion, making the goddess the sister of Helios (the Sun) and Eos (the Dawn). However, other ancient sources claim that she was the child of Pallas and Euryphaessa. Regardless of her ancestry, Selene, as the personification of the Moon, was an influential goddess. One of her best known myths involves the handsome Endymion. The moon-goddess fell in love with this mortal, and she therefore engaged in an affair with Endymion that resulted in the birth of fifty daughters. But Endymion was, alas, human, and so susceptible to aging and eventually death. Selene could not bear the thought of this cruel fate. According to one version of the myth,she made certain that Endymion would remain eternally youthful by casting a spell that would cause him to sleep forever. In this way, Endymion would always live, sleeping through the ages. 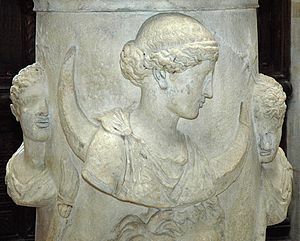 It is also important to note that some Classical authors identified Selene with the Olympian goddess Artemis (indeed, in time Artemis was increasingly recognized as a moon goddess in her own right). Selene was important enough to the ancient Greeks to inspire a Homeric Hymn. The Hymn to Selene describes the beauty and power of the goddess of the moon. with the evening, dividing the months. a most brilliant light appears in the sky. Thus to mortals she is a sign and a token." Selene was called Luna in Roman mythology. *sticks tongue out at sister* Great, I have no way of competing with that, now, do I? I wasn't named after a goddess.